Running 53km anywhere, is tough. Starting out with a 450m climb straight up a mountain makes it a little more daunting. Traversing 23km of single track mountain path takes some training. Trotting along the seaside clifftops puts strain on the fatigued legs. And then descending onto a beach is where one hits the proverbial wall. Only it is softer than a wall. And longer. But it ends. And offers you many more stretches of technical undulations through rocky fynbos pathways with the finish area tantalizingly in view, and very far away. When the front runners take almost an hour to cover the final 6,5km you realize that the Merrell Whale of Trail is really, really tough. 130 exhausted runners finished up the boardwalk on Saturday. And every single one of them was grinning. 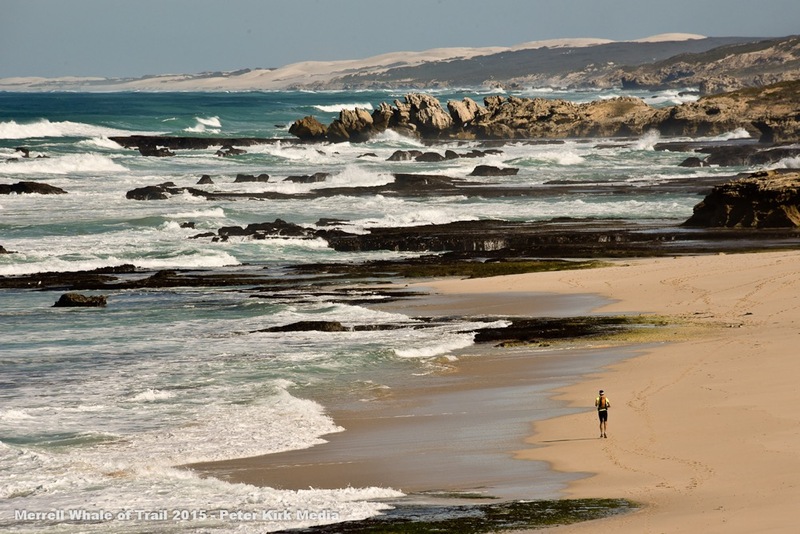 Because each one acknowledged the absolute privilege that they had been granted to be able to run this five day hiking trail in Cape Nature De Hoop Reserve as a race and challenge to themselves. Because despite the difficult terrain they had overcome all thoughts of quitting. Because an abundance of magnificently large whales had been waving them on all the way. There are only so many times in a day that one can say WOW! before searching for another exclamation of astonishment and admiration. The dictionary proposes shouting out holy cow, holy mackerel or holy moly, or flinging cool, amazing, awesome, far out, hot damn, as well as golly, gosh, ye gods and gadzooks into the air. Somehow a whale manages to elicit a feeling of joy in anyone lucky enough to be in their presence. When they are the official cheerleaders, and have combined with a luminous full moon and perfectly clear weather, the entire event is blessed with an aura of magic. This weekend, the Mountain Runner team outdid themselves with impeccable organisation. The De Hoop Collection provides an outstanding venue and superb rooms with bontebok and eland grazing outside, pelicans zooming past and the friendliest and most welcoming staff and hosts. The 7am start at Potberg was crisp as the sun and moon changed shifts. From checkpoint to checkpoint the enthusiasm at the water tables was infectious, laden with PVM energy gels and delicious quiches and chocolates. The finish area down at Koppie Alleen, was bedecked with a Bedouin tent, filled with bean bags and the aroma of delicious potjiekos. Spectators reveled in the whale ballet and runners stumbled across the line and onto beds where they were treated to expert leg massages that ensured they would be able to stumble that little bit further and make it to prize giving dinner. Which was a markedly more animated affair than the previous evening, when those nervous about the tough race ahead had been a tough crowd to entertain. Here’s a fact guaranteed to get the conversation going: A Southern Right Whale has the largest testicles of any animal. His pair can weigh one tonne. Did you just say Wow? Here’s another: A quick calculation determines that the combined weight of 135 runners averaging 70kg does not even make up a set of one whale’s cojones. Last year’s winner Melikhaya Msizi and Chad Gordon joined hands metres before the end to claim a joint first place in 5hr50, eliciting even more feel good oohs and aahs for the day. This broke the 6 hour barrier set before. Eddie Lambert then ran into his young daughter’s outstretched arms prompting yet more goosebumps, followed shortly by Katya Soggot, smiling as usual, who came in strongly as the first lady in 4th position overall in 6hr08. It takes balls to run the Whale of Trail, yet four women made up the top ten finishers. (Did you just say Wow again?) Congratulations to Karoline Henks, Jacqueline Haasbroek, Michelle van Zyl and all the others who completed this marvellous event. Full results are up on www.mountainrunner.co.za. Race images on Mountain Runner Events Facebook page. With generous sponsors Merrell, as well as Nikwax, PVM, Cape Nature and Aquelle on board, the success of this year’s Whale of Trail will no doubt ensure the annual migration of the whales is matched by runners making a pilgrimage to this most spectacular of places for this unique event. Look out for the announcement of next year’s date.